After George Conway's most recent salvo against Donald Trump, Joe and Elie discuss the curious relationship of the senior Wachtell lawyer and Trump's senior aide. Joe and Elie discuss the US News and World Report law school rankings and breaks down who's on top and who's making big moves -- both good and bad -- in this year's rankings. FOX's "Proven Innocent" creator David Elliot, California Innocence Project managing attorney Michael Semanchik, and real-life exoneree Jason Strong, talk about wrongful convictions and the inspiration behind the new show. Ian Bassin, the Executive Director of Protect Democracy, talks about the pressing task of defending democratic institutions from authoritarianism. Executive producer Danny Strong talks about the new legal drama “Proven Innocent” and what drew him to the subject of wrongful convictions. Joe and Elie welcome Michael Avenatti to talk about him challenging Michael Cohen and Donald Trump over their treatment of his client, as well as his thoughts on the 2020 presidential candidates. Joe and Elie attended the Legaltech NY conference, as well as talked about the future of law and the future of law conferences. Elie and Joe have thoughts about the media's willingness to cave to every request of a public relations firm. Elie and Joe talk about Rudy Giuliani's bizarre turn from respected former prosecutor and stealth layoffs appearing in the Biglaw world again. Joe Patrice and Kathryn Rubino cover stuff as well as New Year's "bliss". Should Christmas Eve Be A Firm Holiday? Joe and Elie discuss the major headlines in law firm news. Elie and Joe talk to Ralph Baxter about the future of the legal industry. Joe is left solo to make a few announcements about upcoming opportunities with the Above the Law team. It’s Finals Week for Law Students! Joe and Elie give their best tips on how to prepare for law school finals week. Joe and Elie check in on what's happening with law schools these days. Greg Garman and Talitha Gray talk about their platform, Lawclerk, and how they help efficiently match freelancers with small shops needing a dose of expertise. Joe and Elie recap the top legal stories of last week. Melissa Murray discusses her reaction to student walk-outs and protests and dives into the overall mood on law school campuses these days. Mark Godsey discusses his conversion to an advocate for the wrongfully convicted and his grasp of the psychology that consistently lands the wrong people in prison. Sarah Schaff discusses her legal career and how she's shifted to become an entrepreneur with a product that helps attorneys collect on their bills within hours instead of months. Joe Patrice and Kathryn Rubino talk about the Kavanaugh hearings, recapping the morning testimony of Christine Blasey Ford and discuss the Kavanaugh opening statement in all its ripe-for-SNL-parody glory. Haresh Bhungalia and David Carns talk about the legal technology landscape, Casepoint, and how each are changing the legal workflow. 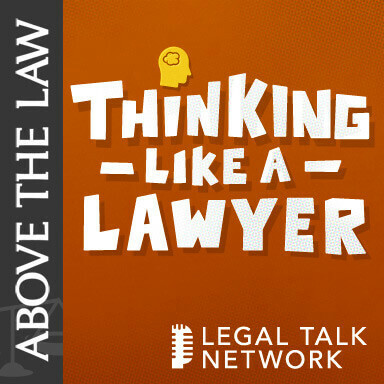 Andrew Eisbrouch and Jesse Weber talk about the Guys Who Law podcast and the Law & Crime network and why broadcasting live courtroom telecasts can inform the public about the judicial system. Joe and Elie review the week that was in the Kavanaugh confirmation fight. Jason Cruz explains the lawsuit against Conor McGregor for throwing cans into the crowd. Joe and Elie play trivia to ask some bar questions that will benefit the DC Bar Pro Bono Project. Kathryn Rubino talks about Tiffany Trump's alleged law school woes and the life of Wachtell's George Conway as he navigates his days married to Kellyanne. Elie and Joe are joined today with Nick Alexiou to discuss the on-campus interviewing process. Joe and Elie give a quick, high-level rundown on the internal investigation process and Ohio State's situation. In today's episode, Joe gives his input on movies that have legal mistakes in them. Joe and Elie talk with guest Dr. Riaz Tejani to join their show as they talk about the dangers of for-profit Law Schools. Tune in as Joe and Elie discuss the Supreme Court nominee, Judge Brett Kavanaugh and what changes they believe could happen. Joe and Elie talk about Vinson & Elkins partner fleeing the scene after swimming away from a boat crash and their thoughts on the topic. Joe and Elie chat with David Lat about Justice Anthony Kennedy’s announced retirement. In today's episode, Elie and Joe discuss some of the worst law school exam questions. Brian Dalton join Elie and Joe to discuss Above the Law's annual ranking of the top law schools in America. Ellen Trachman discusses artificial insemination, custody conundrums, and how twins can be citizens of different countries. Joe and Elie talk about Milbank raising associates salaries, what's happening and what this could mean for the industry at large. Lisa Green talks about Trump family nuptials, and some common pitfalls in the asset protection game. Elie and Joe answer listeners questions about law school and which one to choose and eliminate. Where Should You Go To Law School? Join Joe and Elie as they discuss about the different types of law school and narrow the list for prospective law students. Elie and Joe discuss with Joshua Lenon about global cybersecurity threats and what lawyers can do about them -- for both themselves and their clients. Above the Law Research Director Brian Dalton talks about ATL's law firm brand rankings based on an extensive survey of in-house counsel and what clients are looking for in a law firm. Jordan Weissman talks about Trump's plans to change the nature of student debt, how Elie finally paid off his educational debt, and concussions in the NFL. Thornton McEnery talks about the cryptocurrency market, the role of big banks in the crypto landscape and what's on the horizon in the U.S. and abroad to regulate the market.